Empowering employees to become a partner in the work relationship improves their morale and streamlines your operations. Our Employee Self-Service™ solution gives employees secure and convenient access to information about their specific position and allows them to interact in real time with their supervisors and peers in areas like availability and scheduling. With Logile’s Employee Self-Service™ (solution), store associates will have the flexibility to manage their schedule preferences via cell phone, personal computer or in-store kiosk. 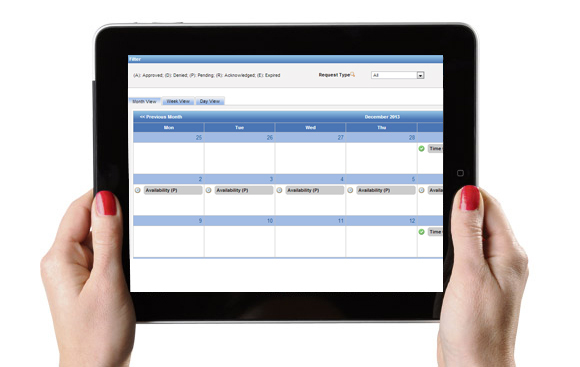 Provides current schedule information to employees via all major mobile devices, as well as desktop computers and store kiosks, allowing employees at their convenience to review their schedule, update scheduling preferences, submit time off requests, shift bid and swap, and engage in other important human resource transactions. Provides access to personal performance information, such as accolades, progressive discipline, job performance metrics, and skills and certifications, so employees always know where they stand. Available in both English and Spanish with flexibility to translate to other languages.